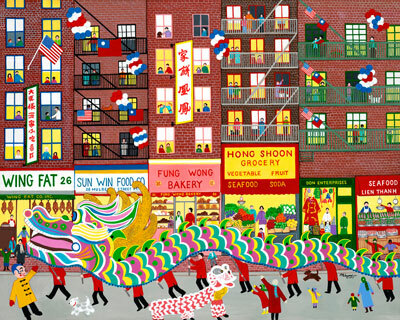 This is my interpretation of the Chinese New Year's parade in New York City. The colorful symbols in the parade and the stores that line the parade route bring much gaiety and fun to the city on New Year's Day. The huge dragon running along the street represents prosperity, good fortune and good luck. Parades are one of my favorite subjects to paint and New York has an abundance of great material.